Francesco Clemente (born March 23, 1952) is an Italian artist most closely associated with the Neo-Expressionist movement. His work reacts against Conceptual and Minimalist Art by returning to figurative ideas and techniques from the past. His work is influenced by other cultures, most strongly that of India, and he frequently collaborates with artists and filmmakers. Notable Quote: "When I look at a drawing of a person, I look at that person as living." 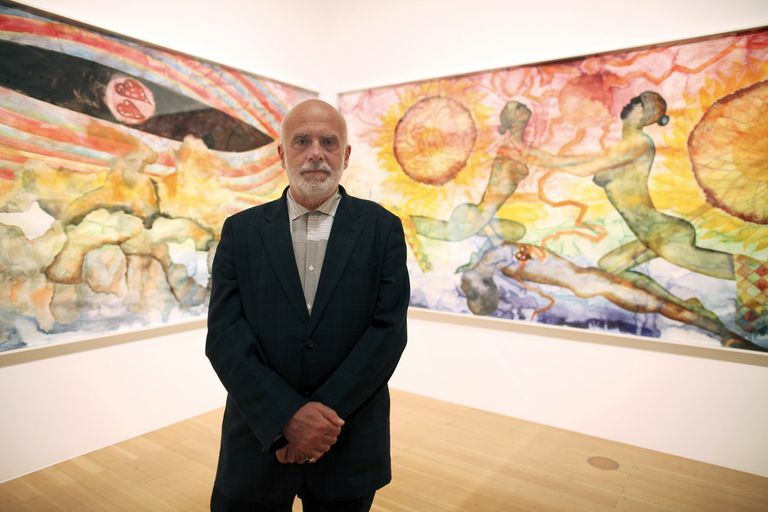 Born into an aristocratic family, Francesco Clemente grew up in Naples, Italy. He studied architecture at the University of Rome. He has spoken about a philosophical crisis that he experienced as a student. 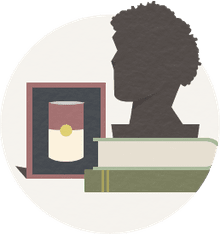 He felt deeply the fact that all people, including himself, would eventually die, and he believed he had no specific separate identity or consciousness from others. He said, "I believe there is such a thing as an imagination shared by the different contemplative traditions." Clemente's first solo exhibition took place in Rome in 1971. His works explored the concept of identity. He studied with Italian conceptual artist Alighiero Boetti and met American artist Cy Twombly, who lived in Italy. Boetti and Clemente traveled to India in 1973. There, Clemente encountered the Indian Buddhist concept of anatman, or lack of self, which became a central thematic element in his work. He opened a studio in Madras, India, and created his 1981 series of gouache paintings titled Francesco Clemente Pinxit while working with painters in the Indian states of Orissa and Jaipur. In 1982, Clemente moved to New York City, where he quickly became a fixture of the art scene. Since then, he has lived primarily in three different cities: Naples, Italy; Varanasi, India; and New York City. Francesco Clemente became part of what was known as the Transavanguardi or Transavantgarde movement among artists in Italy. In the U.S., the movement is considered part of the broader Neo-Expressionist movement. It is a sharp reaction to Conceptual and Minimalist Art. The Neo-Expressionists returned to figurative art, symbolism, and an exploration of emotions in their works. Neo-Expressionism emerged in the late 1970s and began to dominate the art market for the first half of the 1980s. The movement received sharp criticism for the omission or marginalization of female artists in favor of all-male shows. Clemente was at the center of sometimes-heated discussions about Neo-Expressionism and its authenticity. With its relative lack of political content, some observers criticized the movement for being inherently conservative and market-focused instead of concerned with the creation of art itself. Clemente responded that he didn't feel it was necessary to "tamper with reality" in his work and said that he preferred to present the world as it truly exists. One of Clemente's best-known Neo-Expressionist works is his 1983 piece entitled "Name." The vividly-colored painting depicts a man, who looks similar to Clemente, staring out at the viewer. There are small versions of the man inside his ear, eye sockets, and his mouth. Another significant portrait in Clemente's career is his 1997 painting titled "Alba," featuring the artist's wife. She is a frequent subject for his paintings. In the portrait, she is reclining in a slightly uncomfortable pose. The image feels like it is squeezed into the frame, giving the viewer a claustrophobic sensation. Many of Clemente's portraits have a similarly distorted, almost uncomfortable style. In the 1980s, Francesco Clemente began a series of collaborations with other artists, poets, and filmmakers. One of the first of those was a 1983 project with Andy Warhol and Jean-Michel Basquiat. The artists each began their own individual paintings, then swapped so that the next artist could add their own content. The result was a series of canvases full of dramatic flourishes that are instantly recognizable as belonging to an individual artist; these flourishes collide into and overlap each other. In 1983, Clemente began his first project with poet Allen Ginsberg. One of their three collaborative works is the book White Shroud, with illustrations by Francesco Clemente. In the 1990s, Clemente worked with the poet Robert Creeley on a series of books. Another joint project was Clemente's 2008 work with New York's Metropolitan Opera. He first worked with the renowned opera company when he created a large banner for the Philip Glass opera Satyagraha. Later in the year, Clemente created a series of paintings called The Sopranos: portraits of the divas featured in the Metropolitan Opera's 2008-2009 season. They were created over a four-month period and featured the singers in their stage roles. Francesco Clemente began his association with the film industry in 1997, when he made a cameo appearance as a hypnotherapist in Good Will Hunting. In 1998, Clemente created approximately two hundred paintings for director Alfonso Cuaron's adaptation of Charles Dickens' classic Great Expectations. In 2016, Clemente appeared in a film by independent writer, director, and actor Adam Green titled Adam Green's Aladdin. In the reworking of the Arabian Nights story, Aladdin's dysfunctional family lives in an average American city ruled by a corrupt sultan. Francesco Clemente appears as the genie, Mustafa. Clemente is a frequent subject of TV interviews. One of the best-known is an extended interview with Charlie Rose in 2008 from his self-titled PBS show. Clemente's work often defies specific characterization. Although he uses figural techniques associated with Neo-Expressionism, his pieces are not always intensely emotional in content. He eagerly embraces inspiration from artistic traditions other than his own. He encourages other artists to experiment boldly with media and techniques that are new to them. Travels, everyday life, and study in India heavily influence Francesco Clemente's work. He has avidly studied Indian spiritual texts, and he began studying the Sanskrit language in New York in 1981. In 1995, he took a trip to Mount Abu in the Himalayas and painted a watercolor a day for fifty-one consecutive days. The Solomon R. Guggenheim Museum in New York City organized a major retrospective of Clemente's work in 2000. Another retrospective at the Irish Museum of Modern Art in Dublin followed in 2004. Dennison, Lisa. Clemente. Guggenheim Museum Publications, 2000.